When people think “Rome” and “pasta”, there are four main options that come to mind. Amatriciana, Gricia, Cacio e Pepe, and Carbonara. Pasta Carbonara is a classic Roman dish that dates back decades and is so simple to make. With only 3 main ingredients in the sauce, it’s one of those dishes that’s so easy to make at home, but tastes dramatically different in an Italian restaurant. If you want to practice your Italian cooking skills and learn how to make pasta carbonara at home, read on for ingredients, technique and Carbonara recommendations in Rome. Because there are so few ingredients in this recipe, they need to be top-notch and very flavorful. 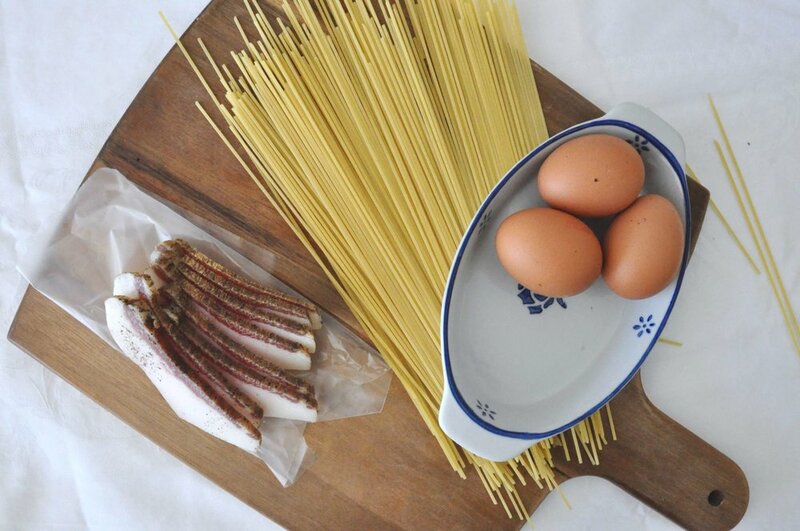 The base of carbonara is a sauce made from melted pork fat, beaten fresh eggs, a good helping of pecorino and the pasta cooking water. The eggs go uncooked into the sauce and are warmed up by the hot pasta and oil, which makes the pasta so creamy. 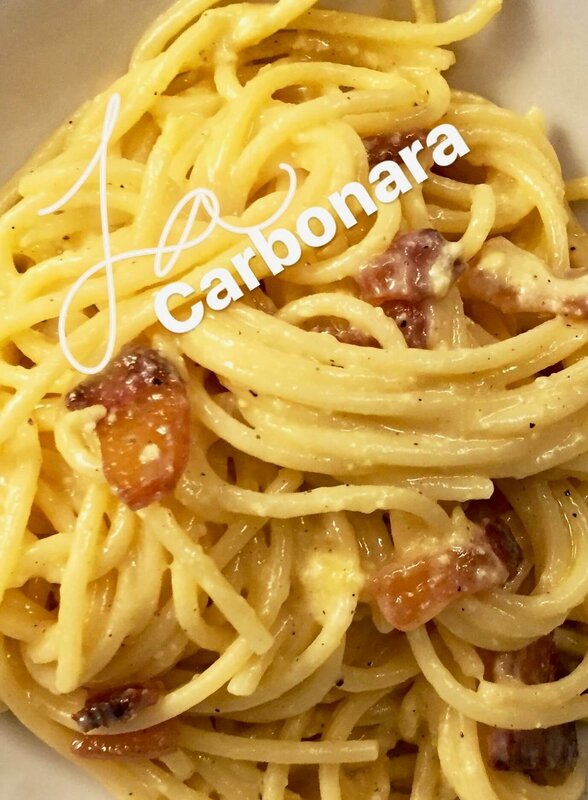 There is no cream, milk, or other ingredients in a classic Roman Carbonara. If you’re nervous about the egg component, buy farm fresh eggs or find another dish. The difference between a good and bad pasta relies a lot on being precise with timing and technique. With Carbonara, the order of steps and timing are key. Bring a large pot of salted water to boil and cook the pasta until al dente. 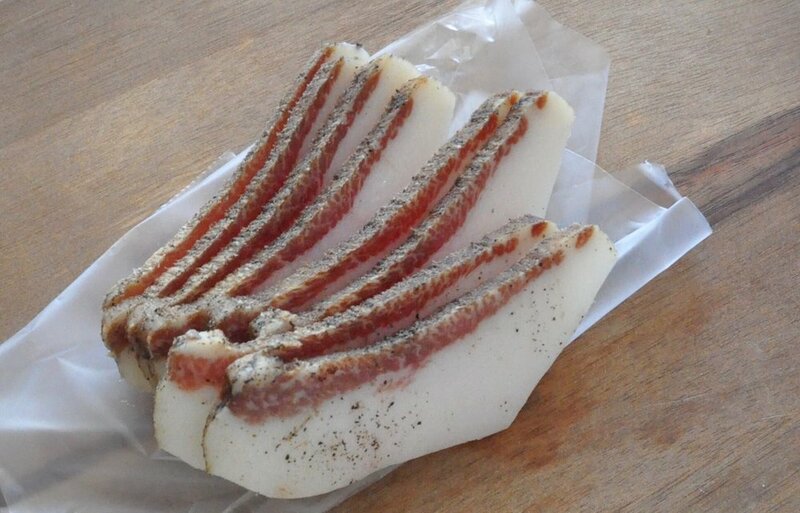 In the meantime, have the guanciale in a large pan on the stove, cooking slowly over low heat. The fat from the pork must be fully rendered for the sauce the come together properly. In a separate bowl, beat the eggs until combined and add the grated pecorino, black pepper and a pinch of salt to the mixture. When the pasta is ready, drain it (reserving a cup) and add to the pan with the guanciale. With the pan off the heat, stir well, until every noodle is coated with fat and slowly add the egg mixture. At this point, start adding a bit of starchy water to the pasta, constantly stirring. It’s better to have a bit more liquid than necessary, because as the pasta sits it will absorb more. Let sit for a couple minutes, covered. Move to plates and add extra pecorino on top, as desired. It's very difficult to go wrong with a plate of carbonara in Rome. Almost every restaurant will have it, but here are some in particular that will blow your pasta-loving mind. Da Danilo—alongside their cacio e pepe, da Danilo's pasta carbonara is one of the best I've had. Go for the wheels of cheese and truffle option. Da Enzo al 29—a classic Roman trattoria with all of the famous pasta dishes, in the heart of Trastevere. Roma Sparita—while I haven't been here myself, it's definitely on the list. Roman Sparita is widely held as some of the best Carbonara in town and that's saying something. Flavio al Valevodetto—go for the big plates, variety of options and wine-cellar setting. 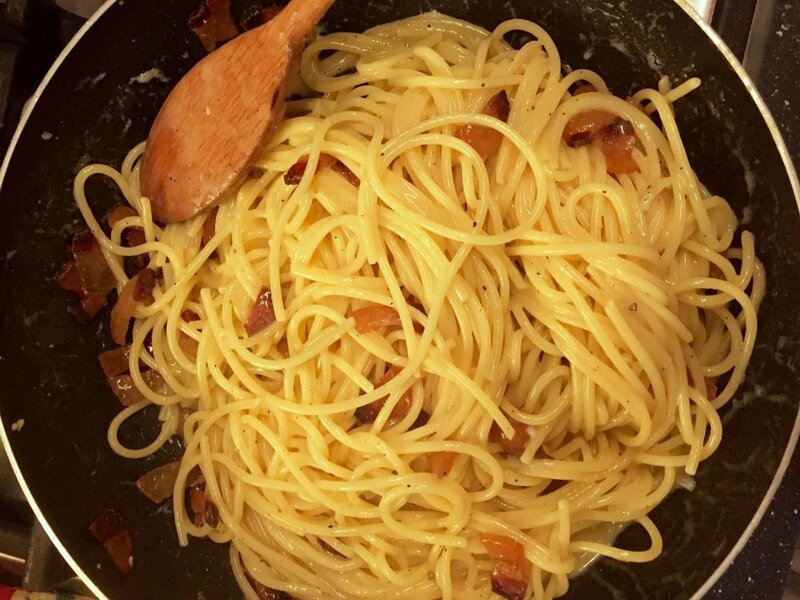 While it will never compete with the carbonara from my favorite restaurants in Rome, this recipe is easy and surprisingly good. Where's your favorite pasta carbonara in Rome? Have you had any success making this in your home?